To install SDSE, double click on SDSE-install.exe then click "Next"
After installation, SDSE will start and adjust REAPER. When it's done you will see a list of drum VSTs on the left of the screen. Select a VST in the list, set up your kit, disable pieces you don't want to export. What is set in the VST is what will be exported. For a first test it is recommended to load a single piece, like a kick drum. For best results avoid using too much compression or excessive volume in the VST, it can greatly reduce the dynamics. Click "Export" in SDSE or press the "F1" key. The screen will take an orange shade and SDSE will start the export process. When the screen returns back to normal, open the "SDSE Sounds" folder on your desktop to find your new .dsnd files, sorted in subfolders. If you exported at least 3 kit pieces you will also find a matching .dkit file in the "SDSE Sounds" folder. When exporting alternate versions of the same kit you can type a short preset name in the text area between the dkit and Options buttons before clicking Export and it will be added to the filenames. Your mouse and keyboard will be blocked when running a job. You can press CTRL+ALT+DEL then ESC at any time to gain back control. Export to WAV files then if the DrumIt profile is selected convert to .dsnd and build a .dkit. Same as F1 but will export all instruments for a single instrument type if BFD2 or Addictive Drums 1 or 2 is loaded with a single kit piece. BFD2: Batch Export will stop when all remaining pieces have been exported for the current sound pack. To export all instruments from a sound pack right click on a kit slot and select the first piece. Addictive Drums 1 and 2: Batch Export will stop when all pieces have been exported for all sound packs. Convert all WAV files found in the destination folder ("SDSE Sounds") to .dsnd if the DrumIt profile is selected. If a supported VST is open the .dsnd files will be named using current kit instrument names. Convert can be used to export from a VST in two steps: Render, edit WAV files manually, Convert. If the DrumIt profile is selected generates a matching .dkit file from .dsnd found in the destination folder or from the current VST kit. When exporting alternate versions of the same kit you can type a short preset name in this text area and it will be added to the filenames. Select the profile that matches your drum module to load recommended settings for the 2box DrumIt Five and DrumIt Three, Alesis Strike, Roland TD-50 or other modules, or select Generic if you don't use a drum module. Settings are saved for the current profile. It's possible to use different profiles and change their settings if you have several drum modules, or reset the settings to default for any profile with the Reset button. The default mode "per VST" will use the recommended setting depending on the VST ("High" for most VSTs). Shorten filenames. Set the minimum to 1 for the DrumIt Five and DrumIt Three, to always shorten filenames. The .dkit format limits filenames to a maximum of 31 characters. When using the default SDSE settings all filenames should be within that limit leaving at least 2 extra characters to use as code names for preset variations. Select Shrink to use abbreviations or Truncate to cut the filenames. Select upper case or lower case to rename the instruments names to upper or lower case. Select Shrink, upper case or lower case to shorten or change the case of the brand in instrument names. Select before or after to preprend or append the library information to the instrument name. Recommended for the DrumIt Five and DrumIt Three to avoid duplicate filenames. Set a kit in one of the supported VSTs and click Export, you won't have to worry about duplicate filenames even when exporting alternate versions of the same kit. On the DrumIt the kits don't save the path to the .dsnd instruments, they can be copied anywhere on the module memory/SD card. This is convenient to manage and sort .dsnd files but when two .dsnd filenames share the same first 31 characters the module can use the wrong file when a kit is loaded. When exporting from a VST to the DrumIt with the default settings SDSE shortens the instrument names and adds a short code for the sound library to minimize the risk of getting duplicate names and to be able to read the instrument names on the DrumIt screen. All the supported VSTs and sound libraries are tested to ensure that the names are short enough and that there aren't any duplicates. To avoid getting duplicate filenames when exporting alternate versions of the same kit pieces it's possible to type a few characters in the Preset field of SDSE to ensure that the set of .dsnd files have unique filenames. This option makes it easier by picking a random 2 characters code when the Preset field is left blank. frequency: remove only duplicates based on frequency and length. - 2Box Editor (default): same curve as the DrumIt Editor, based on sample volume, maintains sample order. 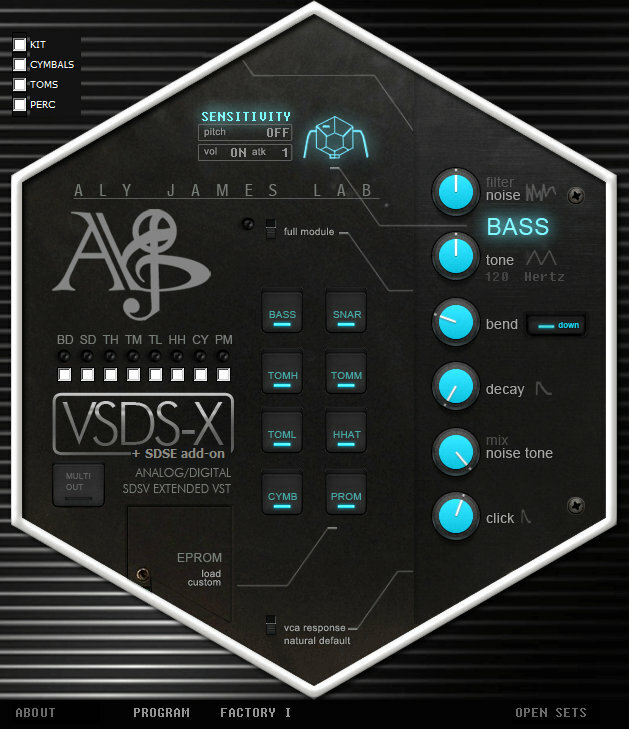 - VST: uses values from the VST, maintains sample order. 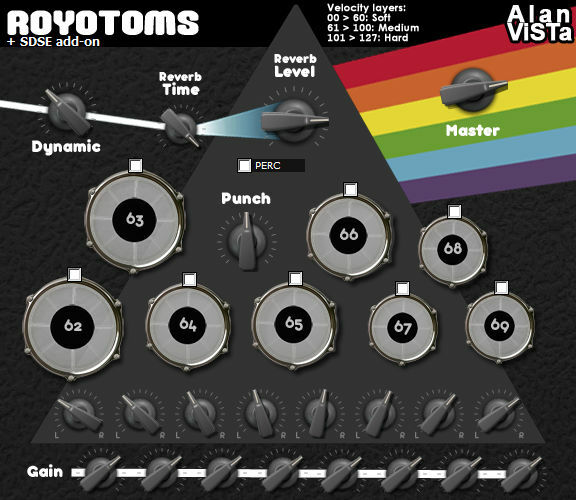 Set it to 2Box DR1-3 or VST DR1-3 for quieter softer hits (better dynamic range). Disable it to let DSoundTool manage the velocities, based on sample volume. The DrumIt Editor and DSoundTool sort samples by volume but it can result in what feels like a "rollercoaster" when samples are not sorted using their original order. This affects all VSTs and Addictive Drums, BFD3, BFD2, BFD Eco in particular. The velocity curve setting always maintains the order of samples so there is a smooth progression in the tone of the sound from quiet to loud velocities. "2Box Editor" uses the same curve used by the DrumIt Editor, but will make exceptions to keep the order of samples. "VST" matches what was played by the VST, with the samples in the correct order. Enable to tune up on the module, from 1 to 12 semitones. It works the same as the setting found in the DrumIt Editor: settings higher than 4 can degrade the sound quality. When disabled it is still possible to tune down the .dsnd on the module. Sort the new instruments in subfolders, by instrument and sound library, sound library or preset name. In the following examples SD3GS is short for Superior Drummer 3 Galaxy Studios (Core library). instr + lib: instrument name and sound library "\Kick SD3GS" "\Snare SD3GS"
instr + VST: instrument name and VST "\Kick SD3" "\Snare SD3"
lib + preset: sound library and preset name "\SD3GS**" or if you enter Rock as a preset name before exporting "\SD3GSRock"
preset: preset name "\**" or if you enter Rock as a preset name before exporting "\Rock"
Set \brand to sort by brand/manufacturer. Set upper case or lower case to use upper case or lower case for the sort folder. Articulation for the snare rim zone, switch to the second articulation after a velocity percentage or disable the percentage to use both. To export a snare with a sidestick sound that switches to a rimshot for the harder hits set Snare Rim to Sidestick, Rim, 85%. Adjust the percentage if needed, increase to get the second sound at higher velocities, decrease to get the second sound at lower velocities. This option requires the Velocity Curve setting to be enabled. 2box snare pad: hit closer to the 2Box logo to get the rimshot and further to get the sidestick sound. It's possible to export 3 zone snares for the 2box DrumIt Three by selecting two additionnal zones and disabling the velocity percentage. For instance set Snare Rim to sidestick, rim, "-"
Export one or all extra Snare articulations as separate files. Export Tom Rim when available, set to "-" to disable. Select rimshot or rim only sounds. Export Ride Bow and Bell when available, set to "-" to disable. Select your preferred Bow and Bell sounds for Superior Drummer 3. Used when all hats articulations wouldn't fit on the drum module. Limits On this page you can set a Minimum and Maximum amount of samples when converting, for each instrument type. When "Remove duplicates" is enabled the exact duplicates are not preserved by the "Minimum" settings because those wouldn't help to improve the playing consistency. If there are more samples than the Maximum limit after duplicates have been removed, more samples will be removed until it matches the limit, by removing samples that are the most alike in priority. Use a fixed amount when there are enough unique samples. Lengths On this page you can set a Maximum duration for samples, for each instrument type. The maximum instrument size is displayed in MB for each instrument type depending on the Maximum amount of samples, maximum length as well as the 16-bit and Mono options. Uncheck to disable the duration limits for all instrument types. When enabled the computer will shut down after a delay that can be set from 1 minute to 24 hours. It can be enabled or set to happen only once. When this setting is enabled a warning message is displayed before exporting. You can use DKit Manager to tell SDSE about your kit layout. It doesn't require the full version of DrumIt Manager, it's completely free in the evaluation version. When you configure the layout SDSE will use the information to create .dkit files that match your kit layout as much as possible. This is interesting if you have split some toms to add more pads or if you use any type of custom kit layout. If you use several DrumIt Five modules you can have different layouts matched to your different modules. When you export a full kit or when you create a .dkit with SDSE it will use the last layout that was selected in DKit Manager. When loading presets using the menu on the top/left INS is always enabled so you won't have to worry about it if you use a preset as a starting point. If you load individual pieces and add EQ to them, make sure to enable INS for Master on the bottom/right of the Addictive Drums 1 window. Without it you can hear the EQ when clicking on pieces but the EQ is not enabled for the main output. SDSE is set up to export the kit pieces when they are loaded in their corresponding channel: tom sounds in tom channels, cymbals in cymbal channels. It is always possible to experiment but when loading instruments in the wrong channel there is a risk that the wrong sounds would be exported. When loading presets make sure to disable the "Key" button to avoid overwriting the default SDSE mapping. Make sure to enable "Drummer Perspective" in the BFD settings if you prefer to have your drums panned this way. SDSE will do this for you if you have BFD3. BFD uses more memory than Superior Drummer 2 or Addictive Drums. Make sure not to load too many kit parts at once if you don't have enough memory to do so. On a system with 4GB of RAM, loading a 10-piece kit on BFD can use all of the available memory. If you have more than 8GB of RAM, you can speed up rendering by enabling "Load all to RAM" in the BFD Preferences and clicking "Restart engine". Make sure to use BFD Eco 1.5.1.5 or newer, older version had issues when rendering with REAPER. Click on Kontakt in the list of VSTs in the SDSE REAPER project. If it's not already expanded, click on the "+ view" button on the right of Kontakt to open the full Kontakt window. You should see a panel on the left, if not, click on the "Browse" button on the top/left of Kontakt. Click on "Add Library" at the top of the left panel, then browse to your Kontakt library. Click on the "Browse" or "Instruments" button under the library item to expand it, then double-click one of the instruments (or drag it to the right panel) to load it in Kontakt. Once your library has been added in Kontakt you will always find it there the next time you open REAPER. When you want to export from another instrument or another Kontakt library, click on the tiny "X" button on the top/right of the Kontakt instrument panel to close it, then double-click or drag another instrument from the left panel. For reference only: Kontakt needs "Inform plug-ins of offline rendering state" to be checked in REAPER Preferences, SDSE will set this for you. There are no restrictions when exporting with the full version of Kontakt. To export from unsupported Kontakt libraries please refer to "Exporting from unsupported VSTs and unsupported Kontakt libraries"
Tip: the free Sennheiser DrumMic'A Kontakt library qualifies to purchase the full version of Kontakt at "crossgrade" price. Some Kontakt libraries require the full version of Kontakt. It is possible to use the free Kontakt Player or the Kontakt evaluation to export from these libraries with SDSE but with some restrictions due to the time limit: it's possible to export one single zone kit piece at a time. The HiHat can't be exported this way. Options/General: set Export Mode to "Medium". Older versions of the Native Instruments Kontakt library with a name ending with "Drums" are not supported in SDSE. SDSE supports the newer version with names ending with "Drummer". Please use Modern Drummer 1.3 or newer. There was a known bug in a previous version of Modern Drummer that prevented it from loading and saving mapping presets, which is required for SDSE. When you load any of the supported Native Instruments Kontakt libraries in REAPER and SDSE is open, you will see the SDSE add-on. If the add-on is not displayed minimize Kontakt with the "-" button on the top/right or disable "Master", "Info", "Output", Keyboard". Click on the check boxes to select the pieces you would like to export before clicking "Export". When you load any of the supported Analogue Drums Kontakt libraries in REAPER and SDSE is open, you will see the SDSE add-on. SDSE exports what is loaded in the VST and it can take some time to remove all pieces from Drumasonic when you just need to export a kick or a snare. The fastest way to start with an empty kit in Drumasonic is to click "All" on the right of "Percussion" then to set each instrument to "All none". You can then save it as a User Preset and load it next time you need to start with an empty kit. DrumMic'a is a free Kontakt library that works with the free Kontakt Player without any limitations. It's a licensed Kontakt library so it requires registration to receive an activation code. Tip: DrumMic'a qualifies to purchase the full version of Kontakt at "crossgrade" price. When you load DrumMic'a in REAPER and SDSE is open, you will see the DrumMic'a SDSE add-on. When you load Alan Vista Royotoms in the SDSE REAPER project and SDSE is open, you will see the SDSE add-on. 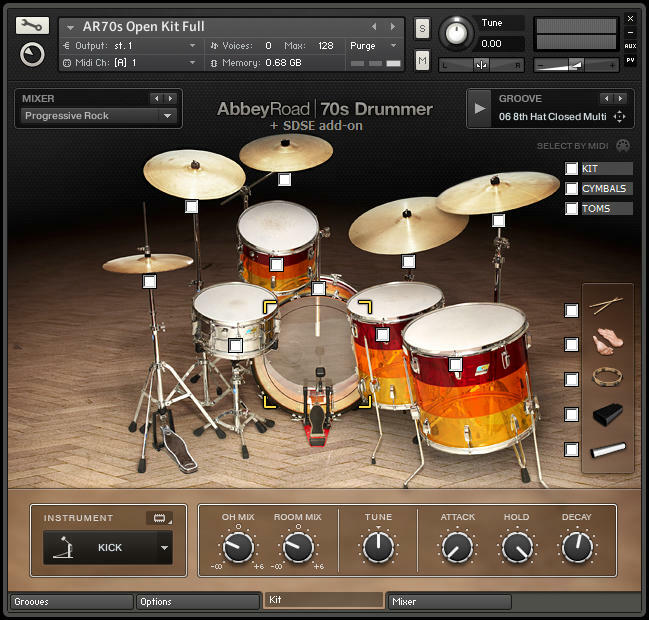 SDSE is compatible with Steven Slate Drums 4. It is not compatible with previous versions that used Kontakt. - click "Account" then "Go to my account"
- scroll down to find "SSD Sampler 1.1 Windows Installer"
It is possible to export single shot samples individually or layered with a kit piece, as long as the mapping of the single shot sample matches one of the kit pieces. The default map for single shot samples is C1(36) so they get exported as a kick by default. If you use a different MIDI mapping to trigger Superior Drummer with a drum module don't forget to change the mapping to Default before exporting. To export cymbals with different bow and bell articulations enable the articulations with the "All articulations" menu in Superior Drummer 3 and set the Crash Bow/Bell or Ride Bow/Bell in SDSE in Options > Zones. To export the Kick Hit disable the Open articulation in "All articulations". "Add Instrument" is not supported but it's possible to replace kit pieces with different instruments from other SDX/EZX packs. The 64-bit version of Superior Drummer 2 is available on the Toontrack website, it's a small installer to update your version of SD2 to the latest version. SDSE will do this for you if you use Superior v2.3.1 or greater, else make sure to Set Voice&Layer to Unlimited. 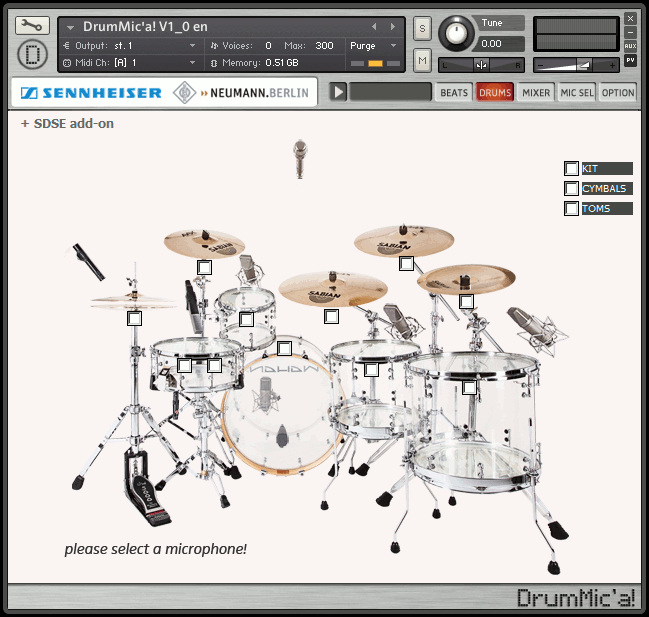 The X-drums feature of Superior Drummer 2 is only supported to layer kit pieces on top of other pieces in SDSE. It is possible to export X-Drums with SDSE as long as the x-drums have a corresponding piece in the main kit. When you load VSDS-X in REAPER and SDSE is open, you will see the VSDS-X SDSE add-on. If you have a sound library ithat s not supported by SDSE please get in touch so that it can be added. BFD3/BFD2/BFD Eco: everything should export but filenames won't be clean and may not fit the 31 characters limit to be used in .dkit files. 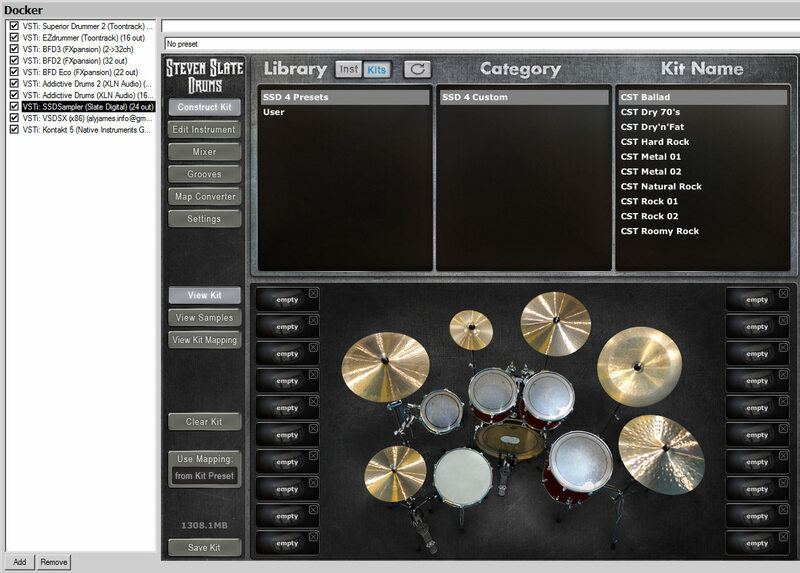 Superior Drummer 2/EZdrummer: the kick and snare will export properly, some toms will, not all cymbals will. filenames won't be clean. Addictive Drums: everything should export but with generic filenames. Steven Slate Drums 4: everything should export but filenames won't be clean and may not fit the 31 characters limit to be used in .dkit files. Native Instruments: won't work at all. SDSE is meant to be as flexible as possible so it's possible to use it to export semi-manually from drum VSTs that are not supported. To export from a VST that is not supported you first need to adjust the MIDI mapping to match the REAPER SDSE project. Some VSTs already have a mapping selection menu, if there is a map for Superior Drummer 2 you can use it and it should work for most pieces. The mapping used by SDSE is close to the general MIDI standard so you may be able to export the Kick, Snare and even Toms from unsupported VSTs without changing any mapping at all. To check if the mapping is already OK you can select a region in the Region/Marker Manager of REAPER (CTRL+ALT+SHIFT+R) then press Space to play it, Space again to stop playback. mark some regions to be rendered (left-click then "Master Mix"). Select the third one when testing to render only one sample. click "Export" in SDSE, it will warn that the VST is not supported but will then render the selected regions to .wav and convert them to .dsnd. If it doesn't work you can open the Render menu in REAPER (CTRL+ALT+R) and click Render. Once all .wav files were rendered close REAPER then open SDSE and click "Convert" in SDSE. It will convert the .wav files to .dsnd. SDSE can batch convert WAV files to .dsnd, without exporting from a VST. To build dsnd files with more than one zone the WAV filenames or folder names must contain a zone name (listed in SDSE_Zones.ini). It can be located anywhere between " - " separators. If you add an instrument name it will be used to name the .dsnd. "SNARE1 - Instrument.wav" + "SNARE1 RIM - Instrument.wav" -> "Instrument.dsnd"
"Instrument - SNARE1 - Comment.wav" -> "Instrument Comment.dsnd"
Sort all files in folders: "SDSE Sounds\tom1" folder with all WAV samples for tom1, "SDSE Sounds\tom1 rim" folder with all Rim samples. It is possible to layer instruments from different VSTs when exporting. The instruments will be named using the kit information from the current VST. The best way is to use the effects and settings built in the VST but you can also add external effects in REAPER. Click on "Add" on the bottom/left of REAPER to open the "Add FX" windows. There are many effects to choose from, including "VST - Reaverbate" for Reverb. Move the effect above your VST in the list so that it is active. Export as usual. You can save the REAPER project as SDSE_FX.rpp to use it another time. You can use DSound Tuner (included with DrumIt Manager) to add reverb to one or several .dsnd files. Zones are identified using filenames set in the .ini file. Those names can be modified to some extent. If needed you can easily change any region to a different note in REAPER. All MIDI items in the track use MIDI note "0" so that the correct note number is displayed once the region is adjusted with shift+9/shift+0. Once you have made modifications to the project you can save it with a name starting with "SDSE_" (SDSE_custom1.rpp). It will work with SDSE as long as the filename starts with "SDSE".